There are many reasons why a retailer would want to dip into the world of ecommerce. For one, you want to grow. 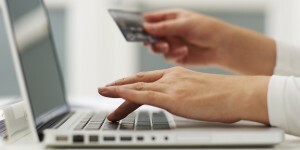 Your customers are already online because they love the convenience of online shopping. If you want to stay current with the latest trends and tap into the digital market, it pays to have an online presence. Two, some items may be easier to sell online. If you have trouble moving your inventory or you have underselling products or services, an online store may be the perfect place to create an additional source of revenue. But if you’re not sure about how to transition to ecommerce successfully, or you’re just hesitant to build or promote your online presence, there are a few things you should know. Measurable results – Online shopping leaves a trail of data that’s easily analyzed. While physical retailers often rely on generic sales figures or customer satisfaction surveys to measure success, data from online users can reveal more significant patterns and customer behaviors, allowing you to target products and prices more directly to consumers. Flexibility – Retail is about reacting to customer’s behavior quickly and efficiently. Changing inventory, pricing, or creating discounts doesn’t always happen instantly in-store, but it can online with the click of a button. Ecommerce stores allow you to quickly notify customers of important information, offer discounts, and promote selected products at the drop of a hat. Brand awareness – Even customers that are already familiar with your physical store may browse products online first before heading there in person to make a final purchase. Your online presence can reach shoppers who are searching online and drive some of them to your nearest location. It has the added benefit of reaching customers who would never set foot in your physical store because of location concerns or other factors. Holiday shopping sales – In-store Black Friday sales fell by 12% last year compared to 2014, while online sales rose by 13%, which makes having an online store completely worthwhile, especially during the holiday shopping season. Consider that overall sales in physical stores fell by 5% or more last year compared to online shopping and you have a valid argument for launching an online store. Low start-up costs – The best part of adding ecommerce is that start-up costs are relatively low. Rent, payroll, utilities, property taxes and insurance will never factor into the equation. In fact, most of your online store can be automated, taking relatively little attention away from your physical location. If you’re still on the fence about setting up an ecommerce store, remember that there’s very little risk involved. If you’re not seeing the results you want, you can always go back to a static website. In all likelihood, however, you may find that having an ecommerce store benefits your physical location more than not having one. If you’ve decided that ecommerce is something you’re ready to try, getting started is fairly straightforward. There are many ecommerce platforms to choose from, whether you’re starting from scratch or simply integrating with your current site. If you’re starting from scratch, consider using platforms like Shopify or BigCommerce, which exist specifically for ecommerce websites. If you already have a WordPress site, you can utilize a platform like WooCommerce to attach a store to your current site. There are also a variety of other plugins and platforms that will allow you to build a store on your current site. If you’re using Shopify or BigCommerce, you will automatically have a merchant account that allows you to accept and process payments online. If you’re using something like WooCommerce, however, you will need to sign up with a third-party merchant account service, like Authorize.net. You may discover that your current POS already integrates with your online store, so if that’s the case, don’t worry about this step. If you don’t have a POS system that’s fit for online use, however, consider upgrading (we recommend Clover) so you can manage both your physical and online stores from one place. Marketing to your brick-and-mortar shoppers won’t be the same as marketing to your online shoppers. TotalRetail has a great article here with advice for marketing to each platform. 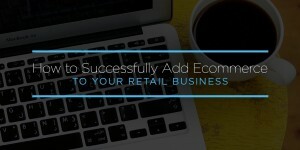 Once you have an ecommerce store setup, you need to know how to use it. 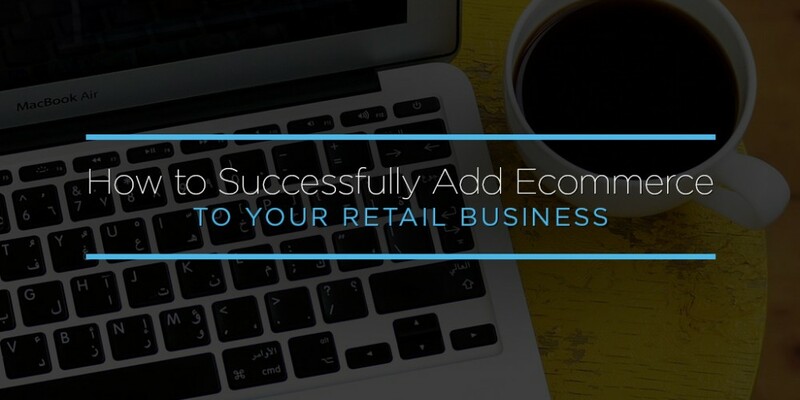 What many retailers don’t realize is that ecommerce is much easier when you already have an established business because you already have an established customer base. Ecommerce is much easier when you already have an established business. Browsing – Allow shoppers the ability to browse your products online before they come in the store. This can be helpful for any type of business, whether it’s browsing a restaurant menu or a selection of clothing or other retail items. Social promotions – Offer in-store or online discounts for customers who promote your company on social media through tagged images or mentions. Delivery – Offer delivery service if a customer is close enough to your physical location. If you really want to reach new customers, you can also offer shipping services for certain products or baked goods for those who can’t access your physical location. 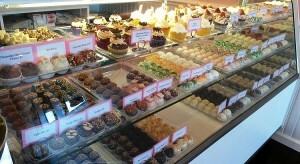 For example, The Cute Little Cake Shop has a physical storefront but also ships their cakes nationwide. Sell gift cards – Many physical stores use their online stores to sell gift cards, which users can either use online or the next time they pop into your store. In-store pickup – Along the same lines as delivery, you can also use your ecommerce store to allow customers to order online but pick up in store. Cross promotion – You can entice your online shoppers into coming to your physical store by offering a discount online if they pickup in-store, or tell people in-store that they can get a discount if they shop online. The possibilities are endless. Don’t be afraid to get creative with your online offering, and remember that your ultimate goal is to make the lives of your customers easier so they come back for more – either in person or online. If you want to drive business to your physical location, or simply expand into a new market, having an ecommerce store in addition to your physical store can be extremely beneficial. Not only will you reach a new market, but you can also make the lives of your current customers much easier. To get started, research the best platforms for ecommerce sites, and if you already have a website, make sure that the integration is seamless. Be sure to consider upgrading your POS system to accommodate both physical and online storefronts, and don’t forget to be creative when it comes to your promotions. Unlike your brick-and-mortar store, the sky is the limit when it comes to building your digital empire. These shops are the perfect example of using both ecommerce and brick-and-mortar shopping. Subscribe to download this list.